KZN health MEC Dr Sibongiseni Dhlomo standing next to an ambulance. The new ambulances will be distributed to all districts, which will boost the province’s ability to deliver emergency medical services in rural and urban areas. KZN Health MEC Dr Sibongiseni Dhlomo unveiled a fleet of brand new ambulances at People’s Park, near the Moses Mabhida Stadium on Wednesday December 20, Berea Mail reports. The new fleet comes just in time for the start of the December festive season. The new ambulances will be distributed to all districts, which will boost the province’s ability to deliver emergency medical services in rural and urban areas. Speaking at the event, Dhlomo said KZN is home to more than 10 million people which amounts to 21 per cent of the population of the country. At least 80 per cent of these people depend on the public health sector for their medical and health needs. “Our Emergency Medical Service is the largest in the country, operating more than 300 ambulances and having more than 2 500 dedicated paramedics in its employ. It is also a function of the EMS component to provide medical care to patients while they are being transported to a healthcare facility. Ambulances are therefore basically a Mobile Emergency Clinic whose personnel are trained to drive it; resuscitate and/or stabilise a patient using sophisticated techniques, equipment and drugs. Everything is done to ensure that the patient maintains his or her condition of stability during the ambulance ride,” said Dhlomo. Like other parts of the country, the province of KwaZulu-Natal is besieged by a quadruple burden of diseases, which is characterised by four epidemics; namely TB, alongside HIV and AIDS; high maternal and child mortality; non-communicable diseases (such as cancer, diabetes, obesity, hypertension, among others); and violence, injuries and trauma. “When it comes to our ability to respond to incidents of violence, injuries and trauma as a department, paramedics play a profoundly critical role in saving lives, the department has been lacking. However, due to the vastness of our province and the rough terrain of some of our roads, our vehicles accumulate high mileage very quickly, which means that they are subject to extraordinary wear and tear, and reach their sell-by date (250 000km) very quickly. They constantly need to be repaired and in some cases replaced. And because replacing them does not come cheap, we are sometimes forced to soldier on and continue using them even when they have reached that replacement threshold. KZN Health MEC Dr Sibongiseni Dhlomo inside the new ambulances that will be distributed. PHOTO. Supplied. “Due to budgetary constraints, we have managed to procure a total of 20 ambulances this time around, at a cost of R15 million. The ambulances that we are handing over are fully equipped to an Intermediate Life Support level, and are in line with the new EMS regulations. They will be distributed to all 11 districts to complement the existing operational fleet during the festive season, and beyond. 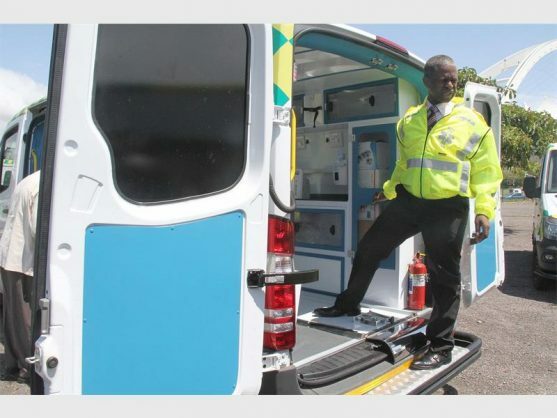 We see investments in new Ambulances as a means to enhance the working environment for this sector whose nature of work is characterised by emergency and urgency,” added Dhlomo.